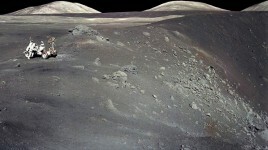 Apollo 17 at the edge of the Shorty Crater which forty years ago was suspected to be an extinct lunar volcano. The moon rock collected there included titanium-rich glasses of the type studied in the experiments at the ESRF. Credit NASA. Contrary to Earth, our Moon has no active volcanoes, and the traces of its past volcanic activity date from billions of years ago. This is surprising because recent Moonquake data suggest that there is plenty of liquid magma deep within the Moon and part of the rocks residing there are thought to be molten. Scientists have now identified a likely reason for this peaceful surface life: the hot, molten rock in the Moon’s deep interior could be so dense that it is simply too heavy to rise to the surface like a bubble in water. For their experiments, the scientists produced microscopic copies of moon rock collected by the Apollo missions and melted them at the extremely high pressures and temperatures found inside the Moon. They then measured their densities with powerful X-ray beams. The results are published in the Journal Nature Geosciences on 19 February 2012. The team was led by Mirjam van Kan Parker and NLSI’s international partner Wim van Westrenen from VU University Amsterdam and comprised of scientists from the Universities of Paris 6/CNRS, Lyon 1/CNRS, Edinburgh, and the European Synchrotron Radiation Facility (ESRF) in Grenoble. To determine the density of lunar magma, Wim van Westrenen and his colleagues synthesized moon rock in their laboratory in Amsterdam, using the composition derived from Apollo samples as their “recipe.” The pressures and temperatures close to the core of the Moon are more than 45,000 bar and about 1500 degrees. It is possible to generate these extreme conditions with small samples, heating them with a high electric current while squashing them in a press. By measuring the attenuation of a powerful synchrotron X-ray beam at the ESRF traversing the sample both solid and molten, the density at high pressure and high temperature could be measured. “We had to use the most brilliant X-ray beam in the world for this experiment because the magma sample is so tiny and confined in a massive, highly absorbing container. Without a bright beam of X-rays, you cannot measure these density variations”, says Mohamed Mezouar from the ESRF. Image of an artificial moon rock sample, measuring about half a millimetre across, made with an electron microprobe at ambient temperature after the experiment with X-rays. The fragmentation of the sample occurred when it was extracted from the small diamond cylinder in which it had been melted under high pressure and temperature. Credit Nature. Such titanium-rich magma can only be formed by melting titanium rich solid rocks. Previous experiments have shown that such rocks were formed soon after the formation of the Moon at shallow levels, close to the surface. How did they get deep into the mantle? The scientists conclude that large vertical movements must have occurred early in the history of the Moon, during which titanium-rich rocks descended from near the surface all the way to the core-mantle boundary. “After descending, magma formed from these near-surface rocks, very rich in titanium, and accumulated at the bottom of the mantle – a bit like an upside-down volcano. Today, the Moon is still cooling down, as are the melts in its interior. In the distant future, the cooler and therefore solidifying melt will change in composition, likely making it less dense than its surroundings. This lighter magma could make its way again up to the surface forming an active volcano on the Moon – what a sight that would be! – but for the time being, this is just a hypothesis to stimulate more experiments,” concludes Wim van Westrenen. Mirjam van Kan Parker et al., Neutral buoyancy of titanium-rich melts in the deep lunar interior, Nature Geoscience advanced online publication, 19 February 2012, DOI 10.1038/NGEO1402.